TOTAL HEALTH SHOW 2017 OPENS TODAY. ALTHOUGH, NHPPA IS NOT ABLE TO BE THERE THIS YEAR, WE WISH SUCCESS TO ALL FRIENDS AND EXHIBITORS ATTENDING! This show has always been a significant event for us since 2008, specifically, for public outreach. Each year, an ever increasing number of public and practitioners learn about the original and ongoing issues. They finally understand the gravity of how the regulations have affected consumers and industry stakeholders over the last 13 years. It is a lot to wrap your head around, and believe, especially when one hears it from industry organizations and stakeholders that are deep down the rabbit hole. If you are not a monthly supporter, please consider contributing to our efforts so that we do not have to reject invitations for Shawn Buckley and the NHPPA team to participate in critical public events and run campaigns in 2017. We hope, that with your help, we can attend the Whole Life Expo in November to make up for this significant absence. Please donate to see us there. 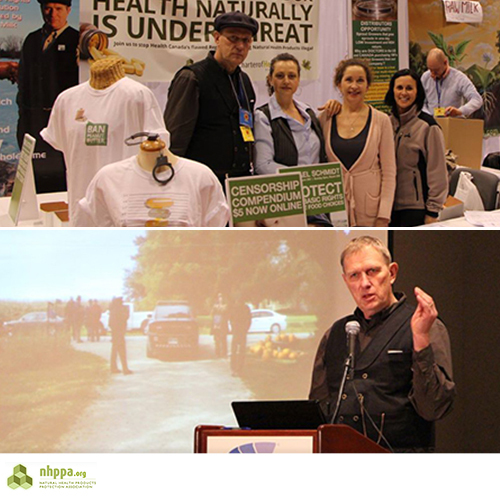 In case you missed it, NHPPA’s efforts at the 2016 Total Health Show were another success! We were privileged to have Michael Schmidt step in at the last minute to take Shawn’s place for the two scheduled lectures. As you may have read in our Facebook posts last year, Shawn was unable to attend as he was in Alberta defending David and Collet Stephan. Watch the recording of the bizarre story about Michael’s 20 year fight for food freedom, the real story behind the sheep napping saga, and how you can be prosecuted for being the subject of unlawful surveillance. The Censorship Compendium [Edition 1] is back on our site as this year’s first fundraising effort. NHPPA developed a unique compendium, including original writings by health freedom experts, regarding censorship in medical, political, scientific arenas as well as educational institutions. The content is at times not surprising, and at others shocking and disturbing. In all cases the information in this compendium is an absolute necessity for understanding how censorship is affecting your health, by restricting what knowledge you can access, where and how it is delivered to you, and who you can trust. For just $10, purchase NHPPA’s featured Censorship Compendium and support our 2017 campaigns and attendance at shows!